Day 2 of shutdown: GOP digs in further… Why it might not end for another week or two… Watching the weak links in this debate (for Dems, red-state senators up for re-election; for GOP, Senate Republicans, House members, and GOP governors)… Shutdown impacting people’s lives… Obama cancels at least half of his upcoming Asia trip, and the whole thing might be next… GOP to Dems: Please negotiate with us!!!... Shutdown overshadows Obamacare’s glitches… And shutdown is last thing Cuccinelli needs. *** GOP digs in deeper: Now in Day 2 of the federal government’s shutdown, House Republicans have dug in even further -- buoyed by a united message yesterday (finally) and by Senate Republicans who are standing behind them (or keeping quiet). As NBC’s Frank Thorp reports, House Republican leadership aides say we could see votes today on the same mini-funding bills that were voted down last night. (Yet unlike last night’s votes, these would need just a simple majority to pass them, not the two-thirds we saw last night. That said, President Obama has still vowed to veto these mini-funding bills, and Senate Majority Leader Harry Reid has declared them a non-starter.) But once you dig in, it becomes harder and harder to get yourself out of the hole. In other words, we THINK we know how this is going to end -- with Republicans, due to all the political pressure they’re receiving, mostly capitulating on their demands to link government operations to the president’s health-care law -- but it’s going to get worse before it gets better. Why? Because Republicans don’t know how to get out of the hole right now. They can’t surrender without getting something for this shutdown, right? *** Why it might not end for another week or two: And it looks like there might not be any urgency to end the standoff until next week or so. The first pressure point comes in two weeks when federal employees -- including congressional staffers -- don’t receive their paychecks. (Federal workers just got paid, so the next paycheck will be in two weeks.) The second pressure point comes on Oct. 17, the drop-dead date for the debt ceiling to be raised. So if things are only going to get worse before they get better, that better time seems another week or two away. And while the president has said he won’t negotiate over the debt ceiling, it might be hard for him to avoid at least discussing the debt ceiling as we get closer to Oct. 17. *** Watching the weak links: What to watch for in these next couple of weeks are both parties’ weak links. For Democrats, their weak links are the red-state Senate Democrats up for re-election next year. And so far, these folks haven’t budged an inch. “The Senate has now passed three responsible measures to keep our government open and our economy growing. Yet the House has continued with their ‘my-way-or-the-highway’ politics,” Sen. Mark Pryor (D-AR) said in a statement. For Republicans, their weak links are Senate Republicans (who are growing frustrated by this standoff), growing voices inside the House caucus to pass a clean CR, and even Republican governors (whose interest it is to be anti-Washington). So Republicans have A LOT more weak links in their chain. Oh, and here’s one other important thing worth noting here: The pressure on Obama to cut a deal isn’t as great as it was in 2011. Why? Because he’s not up for re-election and thus not as sensitive to declining poll numbers. *** Impacting people’s lives: Lost in the legislative back-and-forth is how the government shutdown is impacting -- and hurting -- people’s lives. As NBC’s Peter Alexander reported on “TODAY” this morning, Department of Health and Human Services employee Dawn Heisey-Grove said she worried about when she'll get her next paycheck after being furloughed. "It means that we have to make our groceries extend for two three weeks make the gas in the car last that much longer," said Heisey-Grove, who is the sole income-provider in a household with two children. “It makes our life harder because we are already down to the bare minimum,” she added. Alexander also reported on a couple who were supposed to get married this coming Saturday at the now-closed Jefferson Memorial. That said, there is a reason why some conservative House members aren’t backing down: Their constituents -- in Kansas or Texas, etc. -- aren’t necessarily seeing this same kind of pain. 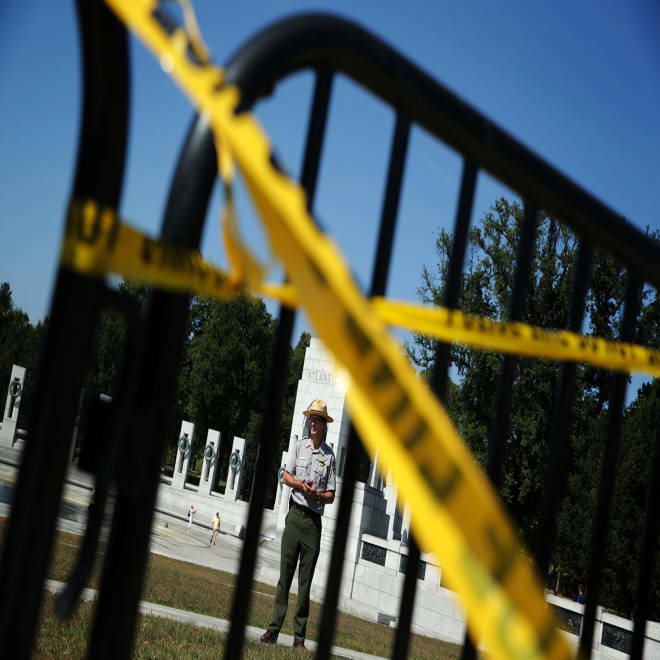 As Rep. Tim Huelskamp told one us, “Most Americans don’t realize the government is shut down. It hasn’t impacted their daily lives. They still got their mail today they are still going to get their Social Security check.” But does that continue to last? When there’s a government shutdown, it’s MUCH easier to find stories where people are hurting rather than benefiting. *** Obama cancels at least half of his Asia trip: As for how else the government shutdown is affecting things… Early this morning, the Obama White House sent official word that it had canceled the president’s upcoming trips to Malaysia and the Philippines because of the government shutdown. “Last night, President Obama called Prime Minister Najib of Malaysia to inform him that, due to the government shutdown, he will not be able to go forward with his planned travel to Malaysia,” one White House email said. A second one: “Last night, President Obama called President Aquino of the Philippines to inform him that, due to the government shutdown, he will not be able to go forward with his planned travel to the Philippines.” For now, the first half of Obama’s Asia trip -- the APEC meeting in picturesque Bali -- is still on. But don’t be surprised if they cancel that, too. *** GOP to Dems: Please negotiate with us! Now two days into the government shutdown, Speaker John Boehner and House Republicans have retreated to this message: The president and Democrats are refusing to negotiate with the GOP. “The fact is that Washington Democrats have slammed the door on reopening the government by refusing to engage in bipartisan talks,” Boehner said in a USA Today op-ed. But what’s especially striking -- if not hypocritical -- about this messaging is that House Republicans, as we’ve pointed out before, REFUSED for months to appoint conferees to negotiate over the budgets the House and Senate, which would have resolved this impasse. What’s more, how do you exactly negotiate over defunding or delaying the president’s prized health-care law, which was litigated during the 2012 election and upheld by the Supreme Court? What House Republicans have called for -- as far as the White House is concerned -- is the equivalent of someone saying they want to negotiate over punching you in the face. The demand is so high, so unrealistic, so brazen that there’s little to actually negotiate. *** Shutdown overshadows Obamacare’s glitches: As for the other big political story from yesterday -- the health-care law’s exchanges opening up -- there were plenty of technical glitches. The New York Times: “Across the country, people trying to use the Internet exchanges expressed mixtures of hope and frustration. At the Jessie Trice Community Health Center in Miami, out of about 70 people who arrived seeking help with the new program before noon, no one was able to get access to the marketplace. All were given appointments to come back another week.” Of course, the government shutdown has overshadowed the orchestrated GOP blitz to highlight all the glitches in yesterday’s health-care rollout. All of the lead stories were about the shutdown, not health care. For the White House, they’re hoping yesterday’s glitches were due to overwhelming demand instead of systemic problems. We’ll have an answer about that in the days and weeks to come. *** Shutdown is last thing Cuccinelli needed: We have one more observation about the shutdown: It’s the last thing that Ken Cuccinelli -- trailing in the polls -- needs right now. He needed the storyline to change, it’s just that this isn’t the storyline he wanted. *** Booker up with negative TV ad: Lastly, we can say that national Democrats have become a little concerned about Cory Booker in his upcoming Senate race against Steve Lonegan. The concern isn’t that Booker is going to lose, but rather that the race isn’t the blowout it should be. Consequently, Booker is up with his first negative ad hitting Lonegan and national Republicans.